Kogalymavia Flight 9268 (KGL 9268/7K9268) was an international chartered passenger flight, operated by Russian airline Kogalymavia, that crashed in northern Sinai following departure from Sharm el-Sheikh International Airport, Egypt, to Pulkovo Airport, St. Petersburg, Russia on 31 October 2015 at 04:13 UTC (07:13 Moscow time). The aircraft, an Airbus A321-231, was carrying 217 passengers and seven crew members. As well as the crew, 214 of those aboard were Russian and three were Ukrainian, mostly tourists. With the death toll of 224 people, the crash of Flight 9268 is the deadliest in Egyptian territory and Russian aviation history, surpassing the 2004 crash of Flash Airlines Flight 604. It is also the deadliest plane crash involving an Airbus A321, surpassing the 2010 crash of AirBlue Flight 202 in Pakistan, and the deadliest of the Airbus A320 family, surpassing TAM Flight 3054 in 2007. Shortly after the crash, the Islamic State of Iraq and the Levant's (ISIL) Sinai Branch claimed responsibility for the incident, which occurred in the vicinity of the Sinai insurgency. The possibility of a bomb being put on the plane at Sharm el-Sheikh led to several countries ordering their planes to stop serving that airport. Flight 9268 left Sharm el-Sheikh airport at 05:50 EST (03:50 UTC) for Pulkovo Airport in Saint Petersburg, Russia, with 217 passengers and seven crew members on board. The aircraft failed to make contact with Cyprus Air Traffic Control 23 minutes later. Russia's Federal Air Transport Agency confirmed the flight had disappeared from radar tracking. There was initial confusion about whether the plane had come down. An Islamic State group in Egypt said that it brought down the plane. Wassim Nasr, France 24’s expert on jihadi movements, said that the IS group has never claimed an attack they did not commit. 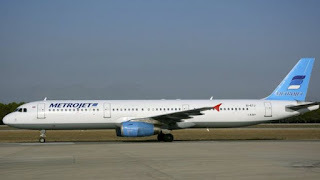 Russian media outlets said that the pilot reported technical problems and requested a landing at the nearest airport before the plane went missing, but Egyptian authorities disputed that claim. Other sources suggested there were no such requests or distress signals. The Egyptian Civilian Aviation Ministry issued a statement that indicated the flight was at an altitude of 31,000 ft (9,400 m) when it disappeared from radar screens after a steep descent of 5,000 ft (1,500 m) in one minute. Flightradar24 shows the aircraft climbing to 33,500 ft (10,200 m) at 404 kn (748 km/h; 465 mph) before suddenly descending to 28,375 ft (8,649 m) at 62 kn (115 km/h; 71 mph) approximately 50 km (31 mi) north east of Nekhel, after which its position was no longer tracked. All 224 passengers and crew died. Reuters quoted an unnamed security officer as saying that the aircraft had been completely destroyed. Wreckage was scattered over a wide area (some 20 square kilometres (8 sq mi)), with the forward section found about 5 kilometres (3.1 mi) from the tail, indicating that the aircraft had broken up during flight. Aerial images of the wreckage broadcast on RT indicated that the wings were intact until impact. The debris pattern, combined with an initial interpretation of the aircraft's abrupt changes in altitude and airspeed, reinforced the presumption that the aircraft's tail separated during flight and fell separately. Flight 9268 was carrying a total of 224 people, consisting of 217 passengers (including 25 children) and seven crew members. Most of the passengers were Russian, according to the Russian embassy, and a majority were female. There were also four Ukrainians and one Belarusian on board. Most of the passengers were tourists returning from Red Sea resorts. The Association of Tour Operators of Russia released the passenger manifest of all those thought to have been on the flight. The majority of the passengers were from Northwest Russia, including Saint Petersburg and the surrounding Leningrad, Novgorod and Pskov oblasts. According to Kogalymavia, the flight's captain, Valery Yurievich Nemov, had more than 12,000 hours of flight time, including 3,800 hours on this aircraft type. The first officer was Sergei Trukachev. The biggest take out from the press conference of November 7th was the admission that USA and UK governments, according to the crash commission chairman, have not shared intelligence data yet. This is contrary to some reports the previous day in Russia. Some debris from the aircraft is still missing. Ayman el Mokadem, head of Egypt's committee into the crash, briefed reporters, but did not specify what pieces were missing. No determination has been made on what brought down, though it believed the Airbus 321 broke up in mid-air. The cockpit voice recorder and flight data recorder were retrieved and their data was successfully downloaded. The CVR has been partially damaged. A "noise" event was heard in the last second of the recording and will be subject to spectral analysis. The recovered debris will be transported to Cairo where it will be examined by experts, including metallurgists. Mokadem confirmed that the committee has not received any of the intelligence from the United States and United Kingdom that both countries have said leads them to believe a bomb was possibly or likely placed aboard. The U.S. intercepted a message between members of a branch of ISIS talking about "something big in the area" prior to the crash. Aviation authorities in Egypt released an interim report in November 2016. However, no final conclusion has yet been reached as to what caused the loss of the aircraft and all passengers and crew.